This next Christmas illustration dates to approximately 1906 and was most likely published in either the United States or Europe. If you’re looking for a simple yet classic vintage holiday card, this is definitely it. 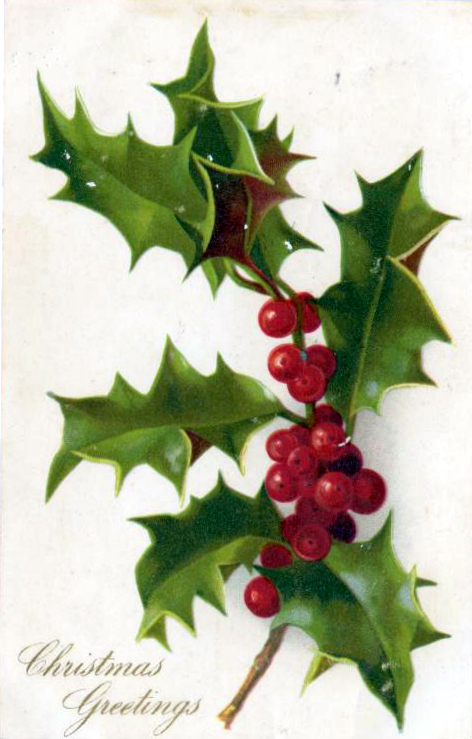 This timeless antique Christmas card features a simple holly branch with berries against a white background. It’s particularly suited for Christmas decoupage, Christmas tree ornaments, and print-and-send holiday cards. You could also use it for thank you notes, gift tags, scrapbooking, and wallpaper images. What more free images for Christmas? Click here to go straight to the complete Christmas illustration collection. You can also like and follow on Facebook for exclusive vintage images that you won’t find on this site.